iZotope, Inc., a leading innovator in digital audio signal processing, announces the release of Ozone 5 and Ozone 5 Advanced. Ozone 5 is an update to iZotope's critically acclaimed software mastering suite. Ozone 5 Advanced is a professional mastering suite that expands Ozone's feature set with individual component plug-ins, extended features, and the brand-new Ozone Meter Bridge. "Whether you're a musician, engineer, or mastering pro, Ozone 5 lets you master music and other audio simply and efficiently," says Nick Dika, iZotope Senior Product Manager. "Ozone 5 is the biggest update we've ever offered, with improvements that will appeal to Ozone experts and new users alike. 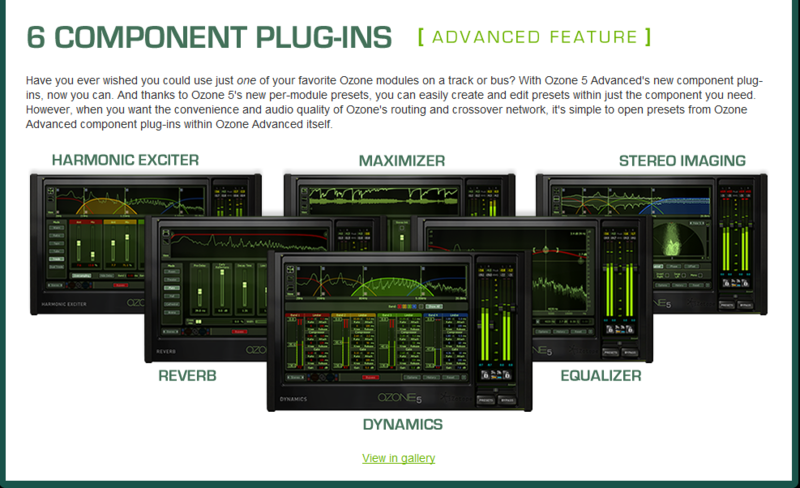 Ozone 5 Advanced is designed to set a new industry standard for mastering tools. Advanced includes many exclusive features, and offers mixing and mastering engineers an even higher level of flexibility, precision and control." Processor: Intel or AMD 1.0 GHz or faster processor. Processor: Intel or AMD 1.5 GHz or faster processor.